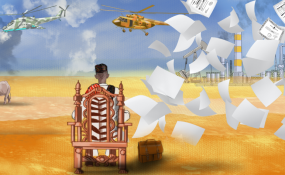 West Africa Leaks - revealing the secret scams of the rich and powerful. Mauritian authorities have frozen 91 bank accounts linked to investor Jean-Claude Bastos, a key figure from the Paradise Papers with close connections to Angola's former leaders. The Mauritius Supreme Court froze accounts in four judgements issued this month as part of probes involving Bastos and part of a $3 billion Angolan sovereign wealth fund investment, according to Mauritian newspaper L'Express. Mauritius' offshore regulator also suspended the licenses of seven investment companies linked to Bastos' Zurich-based management company, Quantum Global. The response by authorities is the latest fall-out from the publication of the Paradise Papers by the International Consortium of Investigative Journalists (ICIJ) in November. The Paradise Papers not only uncovered details about Bastos and Quantum Global's management of Angola's fund but identified their association with global accounting giant KPMG. KPMG worked with Bastos and Quantum Management in Mauritius as tens of millions of dollars were shuffled by them from Angola to Mauritius and beyond. After the Paradise Papers broke, Angola dismissed the sovereign wealth fund's board and set up a supervisory committee to improve the fund's oversight. Earlier this month, the fund confirmed that it would no longer do business with Quantum Global. Bastos is a friend and business mentor of Jose Filomeno de Santos, the son of Angola's former president and former chairman of Angola's sovereign wealth fund. In January, Angola's new president João Lourenço sacked dos Santos as the fund chairman. Prosecutors later charged dos Santos with fraud relating to a $500 million transaction from the central bank. Dos Santos and Bastos have denied accusations of wrongdoing. Bastos and Quantum Global deny any involvement in the allegedly fraudulent transaction. In a statement, Quantum Global said its activities are in line with laws in Angola, Switzerland and Mauritius. "We remain confident and resolute in our ability to defend ourselves vigorously against the unwarranted attacks on our reputation," the company said. Quantum Global announced it had requested an "exhaustive explanation" and an impartial inquiry into the Mauritian regulator's decision. The Mauritius Supreme Court froze one account with Mauritius Commercial Bank, two accounts with the State Bank of Mauritius (SBM) and 22 with Afrasia Bank Mauritius. Number 19 on the Supreme Court's list of Afrasia bank accounts is one belonging to the British Virgin Islands company Capoinvest Limited, which featured in reporting by ICIJ. In 2015, Afrasia proposed that Capoinvest Limited open a bank account in Mauritius, according to emails from the Paradise Papers. Angola's government investment fund later paid $20 million to acquire shares in the BVI company, files reveal. Afrasia told ICIJ that it had "received a Court Order to which we are complying" and could not comment further. In response to questions about due diligence and action taken in relation to accounts linked to Bastos and Quantum Global, Mauritius Commercial Bank told ICIJ "this individual is currently subjected to inquiry in Mauritius" and that it could not comment. SBM told ICIJ that "that there is an investigation in progress, and we will be able to give more details once the investigation is completed." KPMG's Mauritius office advised on tax structures, helped structure Quantum Global's offshore assets and audited companies for years, according to emails, bank account statements and financial reports from the Paradise Papers. KPMG said it was "unable to comment" on its relationship with Bastos.It refused to answer questions about the Mauritius probe, but confirmed it had served as auditors of two Quantum Global funds. The Paradise Papers also reveal that KPMG agreed to work with Bastos and Quantum Global even as other offshore specialists in Jersey and the Isle of Man found his Angolan business too risky. In late 2011, Bastos' advisers approached offshore law firm Appleby in Jersey and the Isle of Man about helping the Angolan-Swiss entrepreneur set up an offshore company to manage his taxes and his interests in Quantum Global. One employee at Appleby's office in Jersey had concerns. "We would need to understand the source of wealth and source of funds," the lawyer wrote to colleagues in an email. "What the assets are, where they are located, how are they currently held etc. Also if as you suggest one of the assets may include an interest in a commercial shipping port in Angola, this would unfortunately not meet our risk." In response, an Appleby employee in Switzerland suggested that Bastos' close relationship with KPMG was a good sign. In addition to working for Quantum Global, KPMG also served as Bastos' personal tax adviser, according to one email. "I assume we can also take a certain amount of comfort from the fact that KPMG are advisers to the client and his businesses," wrote the managing partner in Zurich. Bastos ultimately dropped the Jersey proposal, according to emails between lawyers who wrote Bastos believed he had "lost a couple of weeks faffing [wasting time]." Mauritius regulators have opened an investigation into Bastos and Quantum Global's investments, according to L'Express. This story was first published by the International Consortium of Investigative Journalists. Copyright © 2018 International Consortium of Investigative Journalists. All rights reserved. Distributed by AllAfrica Global Media (allAfrica.com). To contact the copyright holder directly for corrections — or for permission to republish or make other authorized use of this material, click here.